The Easter bunny is coming… the Easter bunny is coming! For those of you who enjoy getting a little crafty with your Easter “baskets” we have a great idea for you. 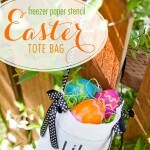 A freezer paper stencil tote bag for the kids to hold their goodies. Lots and lots of goodies.